New custom built home, 10 year home warranty included, unobstructed 180 degree lake & valley views! Beautiful private 2.49 acre setting with no neighbouring homes in your sight line and generous leveling of this lot allows for ample parking plus room for a pool. 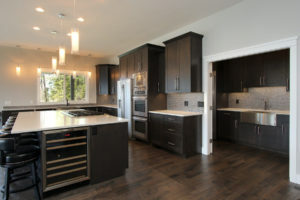 This exceptional 5 bedroom + den, 5 bath home offers complete attention to detail with high-end finishing & custom quality fixtures throughout including soaring ceilings, surround sound, quartz counters, hand-scraped antiqued maple hardwood, polished concrete heated floors and solid quartz stonework. An ornate chandelier adorns the 2 storey entry which leads to the open concept upper level. Enjoy the stunning lake views, the expansive covered deck and the entertainer/chef’s dream kitchen with restaurant grade appliances, a massive island and butler’s pantry complete with a full sized side-by-side fridge/freezer.